July 28, 2014 — In my U.S. travels, I’m always surprised when I run into international tourists. It’s definitely my home-field jadedness, but there are so few places in the States that I could imagine worth crossing oceans or trekking the length of the world to see. 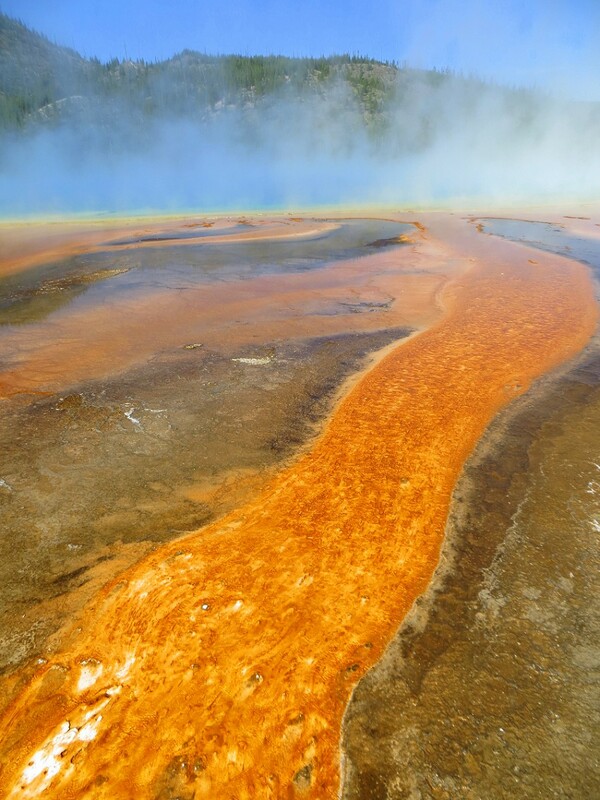 But Yellowstone. I would trek to far-off places myself for what Yellowstone offers. Like an outer rim planet far-off. When I’m elected President, the first thing I’d executive order would be to change the name of this park to something that better conveys its exoticness. 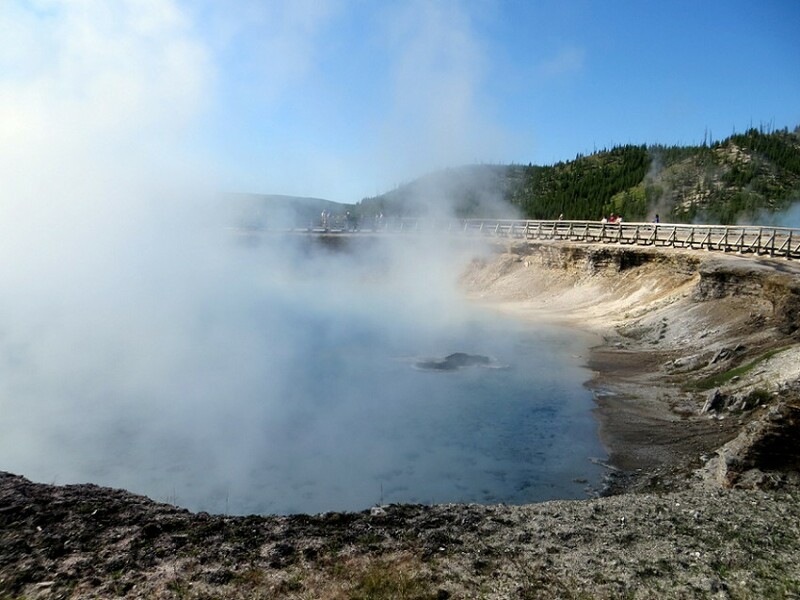 I’m thinking Supervolcano National Park or Fireworld National Park. Sorry, but I’m President. I don’t have a lot of time to think up creative names. Now, my friend and I knew we wouldn’t have much time to spend in the park and that it was basically the natural-world equivalent of Disneyland, so we decided in advance that we’d find one thing in the park that, if it were the only thing we saw, we could call the jaunt a success. 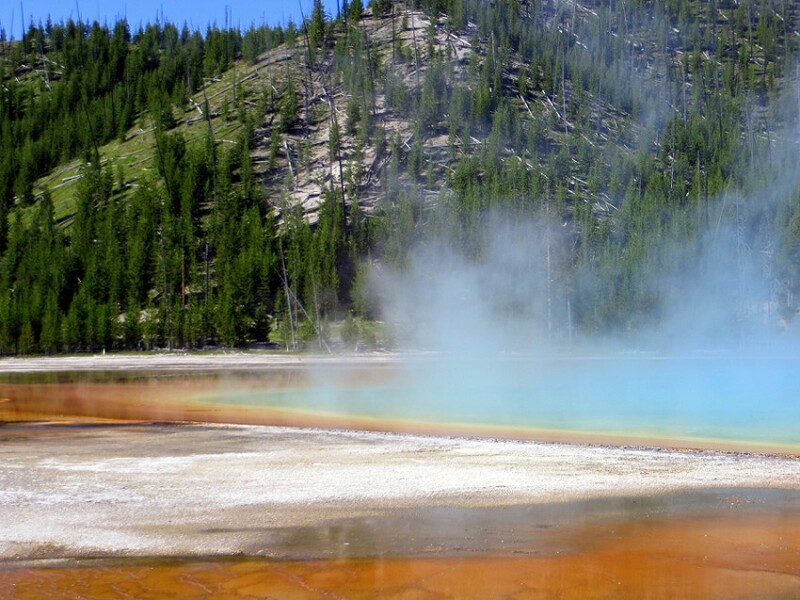 And that one thing…was Grand Prismatic Spring. Technically, it’s just a hot spring. Sure, at 300 feet in diameter and 160 feet deep, it’s the largest hot spring in the country and third largest in the world, but still, it’s a just hot spring. But here’s the thing…about this hot spring. 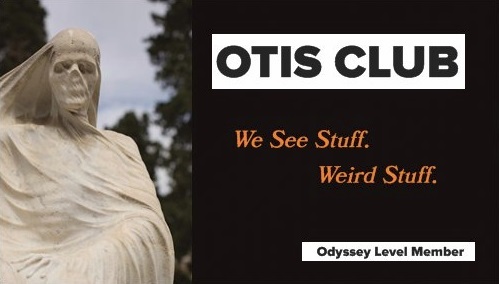 It’s psychedelic, man. 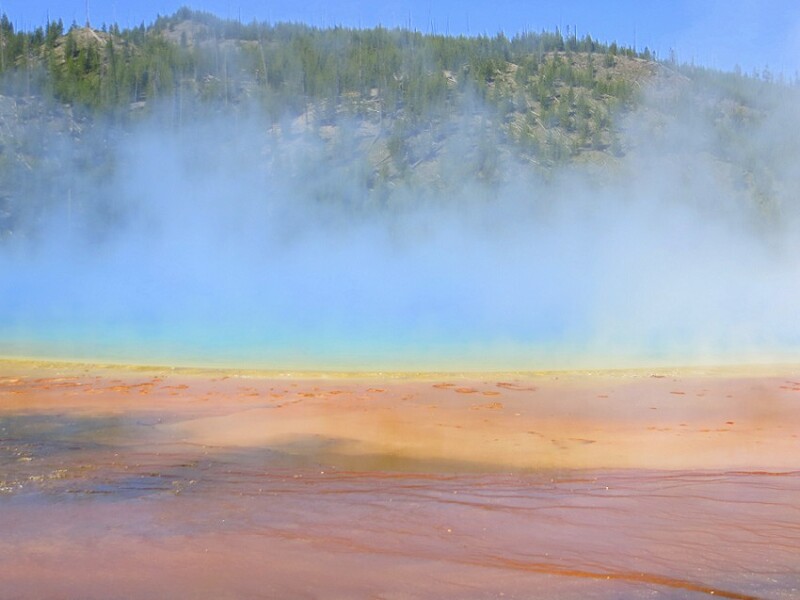 Grand Prismatic Spring is a pool of hot Technicolor water that looks like something you’d find under a microscope. Or some kind of feature of a gas giant or emission nebula. Or a portal to another dimension. Or something made completely out of CGI for a major motion picture. The color in the center is a deep, Caribbean blue which then graduates outward to bright green, yellow, orange and red. Basically all the colors refracted by a prism, hence the name. The optimum way to see this spring is from the air. We were, of course, at ground level, on a boardwalk that crosses the outer orange/red area. From this vantage, the pool is foreshortened so our view was gradations of colored ground with little shape. Also the steam obscured a lot of the middle, bluer parts of the pool. The experience is a lot like…I don’t know, what’s an improbable comparison…going to a football game. Awe-inspiring, but better on TV. Still, it was mind-boggling enough that had this been all I saw at Yellowstone, I’d be way happy. 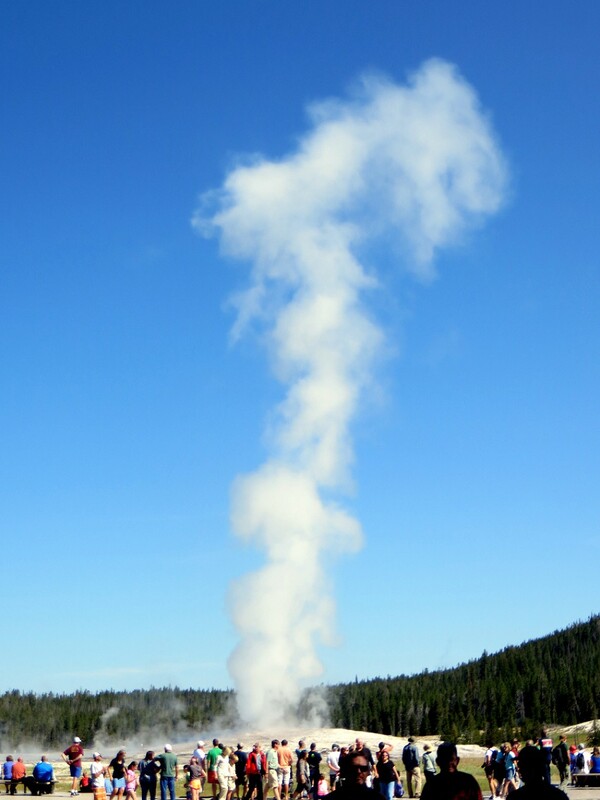 But next and last on our list was the most famous site in the park: Old Faithful itself. The area around Old Faithful is kind of like an oasis of civilization in the wild. There were restaurants and hotels and museums and, for goodness’ sake, cell signal, which he hadn’t had our entire stay in the park and in fact hardly had at all on our trip through the open spaces of Washington, Montana, and Wyoming. The crowds had also started to grow. 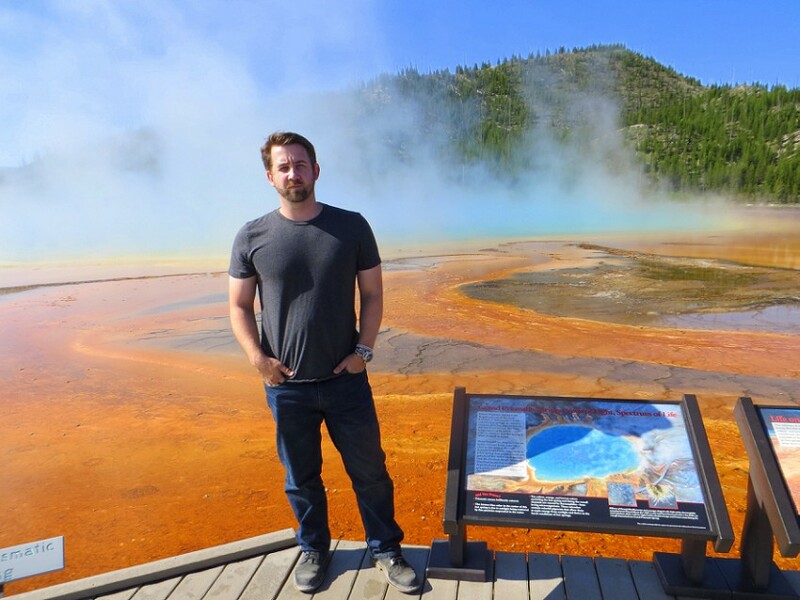 It had gone from just four other people that morning at Artists Paint Pots to a couple of tour buses’ worth at the Monuments Geyser Basin and the Grand Prismatic Spring. Now, were pulling into what was basically a mall parking lot, and the whole thing was full. Honestly, though, in respect to the crowds, it was surprisingly not terrible. We were expecting traffic jams and jumping above the heads of kids on fathers’ shoulders to see sites. After all, we were at a major tourist attraction almost equidistant from all points in the country on a weekend in the middle of summer. But the level of crowd ranged from ideal to not at all bad. I mean, I didn’t once have that cloying, panicky disgust for close-packed humanity bubble up and overtake me with suicidal feelings about the emptiness and futility of life. Not even once. Old Faithful throws (and I’m giving the high-end numbers here) 8,400 gallons of scalding water as high as 185 feet for up to five minutes. And we arrived just in time to see it from the parking lot, shooting whiteness high into the blue sky over the tops of green trees. I wouldn’t call it bad timing, since Old Faithful is one of the least astounding things in the park, but it was certainly annoying timing. By the time we raced up to grab a closer view, it was all steam and exiting tourists. Since it would be another 90 minutes until its next eruption and we had a nine-hour drive to Denver hanging over our heads, we decided we’d seen enough of it from the parking lot. 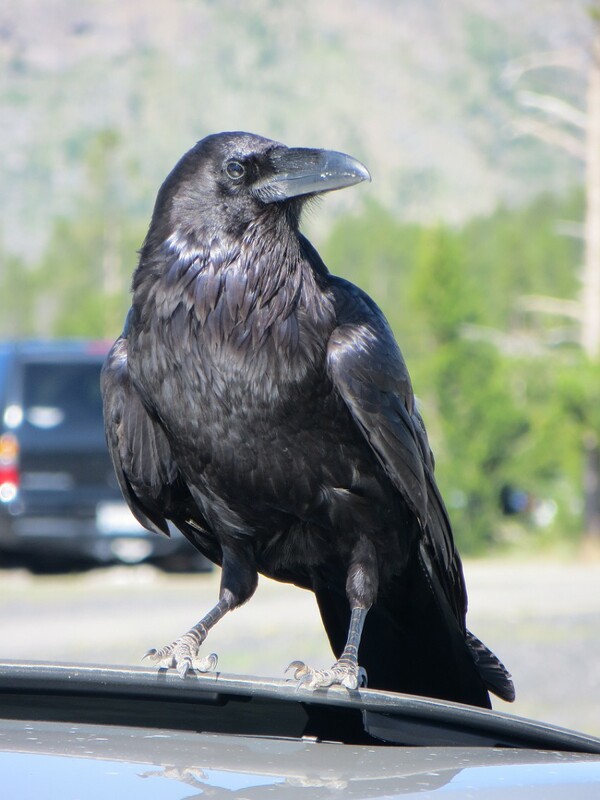 We did, however, see this massive birdie owning the parking lot. 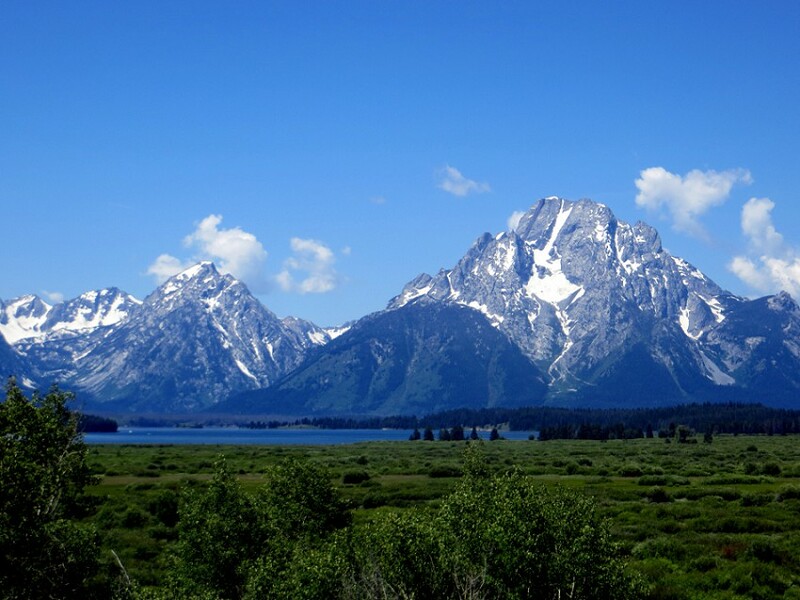 We exited the park through the south entrance, which is where Yellowstone meets Grand Teton National Park. There we were treated to towering jagged peaks laced with snow and more warning signs for bears instead of actual bears. I’m so coming back to Yellowstone. And I’ll do it right. Bring my family. See every site. Hike. Maybe camp. Raft down its boiling rivers. Charter a copter. Hopefully the Supervolcano holds off long enough for that. I mean, between the hour or so the previous night and the seven hours we spent the next day, we were there for about the length of your average work day… and I ended up with three posts’ worth of memories. A week there will change the course of my life. Unless I still don’t see a grizzly.